(xv) The coastal area of Pak. is about —.—— Kilometers long. 2. (i) Write the fundamental concepts of Islamic Ideology..
(a) The Holy Qur’an: The Our’an is the permanent basis of Islam. It provides detailed guidance to the people, concerning social and economic laws, leading to a sustainable, peaceful and purposeful life at the individual and collective levels. (c) Traditions and Cultural Values: The values and traditions, such as festivals, gathering and ceremonies which do not run opposite to the teachings of Islam, are allowed to be followed by the Muslims in their respective regions. (ii) Describe the Movement of Syed Ahmed Shaheed Barelvi. According to Syed Ahmed Shaheed Brelvi, the main cause of the problems of the Muslims in South Asia was their separation from the teachings of Islam. There was no spirit of preaching Islam among the Muslims in his period and their hearts become empty from the spirit of the holy was for Islam. He wanted to make the Muslims as the true lover of Islam for this purpose he started the Mujahideen movement. (iii) Write three causes of the high population growth in Pak. (i) Early marriage particularly in rural areas. (ii) Religions and social attitudes of people and general tendency to prefer larger families. (iii) Illiterate and poverty ridden society unaware of the responsibilities of married life. (iv) Write three sentences on the census held in Pakistan. (i) By knowing the exact population the government can plan and can estimate different budgets in and efficient manner. (iii) The percentage of literacy is known and in its light better educational planning can be done. (v) Write down’ three exports, and three imports of Pakistan. (vi) Write three aims and objectives of the establishment of All India Muslim League. (a) To establish good friendly relations between the British Govt. and Muslims. (b) To co-ordinate with other nations and political parties in the sub- continent for common welfare. (c) To protect the right of the Muslims by seeking co-operation of the government and other parties. (vii) Write three sentences on the objectives Resolution of Pakistan. In the history of constitution making in Pakistan, the Objective Resolution is an important document and a basic step to frame the constitution. It was approved on March 12, 1949. In this Resolution Islam was declared as the foundation of the Constitution of Pakistan. It was also declared that all powers and sovereignty rests with Almighty Allah. It was also declared that the principles of democracy. Equally and social justice which are described by Islam would be implemented in Pakistan. So that the people could reform their lives according to the teaching of Islam. (viii) Write three sentences on Pakistan Resolution. The annual session of Muslim League was held in Lahore in March 1940, Maulvi Fazlul Haq presented a resolution about the future of the Muslims of subcontinent. It was unanimously passed. By the Pakistan Resolution, the Muslim League had decided its goal and had set up a plan for the Political struggle of Muslims for the establishment of a new state. (ix) Write three sentences on the advantages of technical and professional education. (i) Technical education enables the youngsters to become useful and important citizens. (ii) Vocational education enables the students to adopt profession most suitable to them according to their aptitude and abilities. (iii) Technologists produced by technical education, help the country in industrial progress. (x) Write three sentences on the importance of Natural Gas. Natural gas is a comparatively cheaper and the most effcient source of energy in Pakistan. More then forty percent of our energy requirement is met with natural gas Sui. Natural gas is used for power generation and by industry. (xi) Write three Islamic Provisions of the Constitution of 1973 A.D.
(i) Education of Quran was considered must. (ii) Islamiat was declared as a compulsory subject. (iii) Every ruler will protect Islamic provisions. (xii) Name three important industries of Pakistan and their centers of location. (i) sports Industry: Center Sialkot, Lahore and Karachi. (ii) Cotton Industry: Center Karachi, Faisalabad & Peshwar. (iii) Cement Industry: Center Karachi and Hyderabad. (xiii) What do ‘you mean by culture and state its three characteristics. (xiv) Write down any three difficulties faced by Pakistan soon after its creation. Kashmir issue posed a threat right from the time of creation of Pakistan. (ii) Issue of Refugees: Thousands or refugees who reached Pakistan after facing communal riots and killing of Muslims in india; were in a pathetic condition. They had to be provided immediate loading and boarding. The government had to create a separate department of rehabilitation for solving problems of refugees. (iii) Issue of division of assets: India wanted to keep all assets and refused to give Pakistan its due and agreed share. (xvi) Write down three important objectives of educational system of Pakistan. (a) Education help in developing creative oblates & of people. (b) Education helps mankind to pass through many stages of evolution. (c) With the help of education man has achieved success in discovering the secretes of atoms and universe. Note: Attempt 2 questions from this section. 3. (a) Describe the sources of Islamic Ideology. The Qur’an is the permanent basis of Islam. It provides detailed guidance to the’ people, concerning social and economic laws, leading to a sustainable, peaceful and purposeful life at the individual and collective levels. The values and traditions, such as festivals, gathering and ceremonies which do not run opposite to the teachings of Islam, are allowed to be followed by the Muslims in their respective regions. 3. (b) Describe the importance of geographical location of Pakistan in South Asia. Pakistan’s geographical location is very important. China, Russia and India are our neighbors. After the advent of Russia in Afghanistan, the friendly countries of Pakistan have realized importance of Pakistan. Pakistan has friendly relations with its neighbors, and trade relations are increasing. With China Pakistan have trade and other relation. The land route between Europe and the East also passes through Pakistan. In addition it provides a contact between European and Asian Countries. Pakistan is the nearest country to Europe and America in the area of South-West-Asia. As such the southwestern Asian countries do their. trade with European countries, through Pakistan. The ships going to America and Europe, from south East Asia, for east and Australia pass through the seaport of Karachi, Pakistan. Also the air routs from Europe to Asia countries pass through Pakistan. In this way the location of Pakistan has great importance. 4. (a) Describe the importance of Urdu as a National Language. The importance of National Language is evident as at the time of creation of Pakistan, Muslims were introduced as a separate nation on the basis of religion, culture as we” as language. Sir Syed, Allama Iqbal, Shibli Nomani, Quaid-e-Azam and a number of leaders preferred Urdu to Hindi and English. Thus proved that other than Islam Urdu is the next entity of Muslims of subcontinent. Urdu language is comprised of alphabets of various languages. It comprises of Arabic, Persian, Hindi, Punjabi, Sindhi, Balochi, Saraiki and Kashmiri. Due to its easiness and simplicity it is used not only in Pakistan but also in most of the countries of the world. It is counted as an .international language. Urdu is not a newly born language. We have received it ininheritance from our forefathers. In ancient time, the Arians came to Asia, they spoke Sansikrit with the passage of time, in addition with weal language, their came changes in it and them it came to be known us PRAKRAT. Various Muslims rulers ruled over India. They spoke Persian, which came into existence by amalgamation of Arabic and Turkish. Therefore in Parakrit with addition of Persian a new language came into existence, which was impure of raw Urdu, and with the passage of time now it is highly refined. Urdu has a precious storage of poem and prose and it is – gradually increasing. It is educational as we” as official language of Pakistan as we” as a symbol of unity and honour for the people of Pakistan. Culture and customs are lifeblood of a nation. These culture and customs distinguishes a country and nation from another. People of various nations spends their life in accordance with their religion, social and cultural requirements, as we” as language plays an important role in a nations way of living. A country consists of provinces and provinces consist of cities, towns and villages various languages are spoken in different areas and cities and then in provinces. Through regional languages have heir-own importance but their always exits need for a national languages. A national language is a symbol of unity among various parts of country as well as a communicating media among people of various regions of a country. 4. (b) Mention the role of Shah Waliullah in the Revivalist Movement. Hazrat Shah Waliullah Muhaddis Dehlvi was born on February 21, 1703. His real name was Qutubuddin Hazrat Shah Waliullah played a great role to control the downfall of the Muslims in South Asia, he made efforts to reform the educational and religious conditions of the Muslims. He tried to explain the real teachings of Islam. The review of the role of Shah Waliullah in the revivalist movement of Islam in South Asia is following. (1) Shah Waliullah very minutely the factors for the downfall and concluded that it has due to the increasing influence of the non-Muslims. The military strength of the Muslims had collapsed and they were at the mercy of the tribal might of Jats and Marathas. Shah Waliullah realized that if Muslims did not abide by Islam, they would gradually lose their status. In these circumstances, he planned to revive Islamic teachings and values in the sub-continent. (2) Shah Waliullah wrote open letters to the Mughal emperors of that time, the Nizam of Hyderabad Deccan, Rohila Sardar Hafizul Malik and Najibuddula. He warned them about the declining state of the Muslims in the sub-continent. (3) He also wrote the ruler of Afghanistan Ahmed Shah Abdali to save the Muslims of India from the atrocities of Marathas. There upon Ahmed Shah Abdali in 1761, inflicted a crushing defeat on the Marathas at the third battle for Panipat. (4) Shah Waliullah tried to minimize the differences among the scholars of the Muslims. (5) Shah Waliullah translated the Holy Quran in Persian language in 1738 hich was published with the name of “Fatehul- Qur’an”. It was his great effort to make inform common people about the teaching of the Holy Quran. After this his son Shah Rafi-ullah translated the Holy Quran in Urdu Language. (6) Shah Waliullah also wrote books on Hadith, Islamic jurisprudence and Tafseer. The most popular among these is his famous work “Hujjat-ul-La-Hal-Baligha”. The message of this work is that Islam is the universal religion. It guarantees progress and prosperity for the whole of man kind. Hazrat Shah Waliullah was the great politician and thinker a his time. Shah Waliullah presented comprehensive theories a a he fundamental rights and economic balance. After the death of the Mughal emperor Aurangzeb Alamgir in 1707, the Muslims started deviating from the principles of Islam and so their power and influence started to decline in the sub-continent. Realizing this, a number of religious scholar and reformers started movements for the revival if Islamic; teachings. Faraizi movement is one of these movements, which created awakening among the Muslims of the sub-Continent. Haji Shariatullah started the Faraizi Movement. He was the most prominent reformer who started reviving Islamic thinking among the Muslims of the sun-continent. The slogan of this movement was “The earth belong to Allah”. (i) To make the society pure from Hindu tradition. (iii) To improve the conditions of the Muslims farmer and encourage them. (iv) To motivate the Muslims towards Islamic obligations. (v) To revive the teachings of lslarrr S prepare the Muslims to pass their lives simply according to teachings of Islam. (vi) To protect the Muslims from the worship of things except Allah. (vii) To preach Jihad because it was not possible to get freedom from evil force without armed struggle. The Faraizi Movement proved to be a milestone in the history of Bengal and a period renaissance was started. (i) It influenced Bengal as well as other parts of the sub Continent. (ii) It helped the Muslims to reform their faith in Islam. (iii) Faraizi Movement played an important role in developing love, fraternity, equality & brotherhood among Muslims. (iv) A sense of human respect was developed among the Muslims of Bengal. (v) Tradition related to Hindu culture and other un-Islamic customs were ended in the Muslims society. Thus it can be said that the Faraizi Movement produced a spirit of self-confidence and opened the way of mutual co-operation for the Muslims. They become aware of their rights and problems and got a chance to unit as a nation. (i) Forest provides good quality timber for furniture. (ii) Fertility of soil remains intact and flood devastation in rivers in reduced. (iii) Forest provides number of products like honey, silk worn, herbs and firewood. (iv) Forests provided wood for fuel and construction work. (v) Forests provide raw material for paper, rubber, matches, medicines and sports goods. (vi) Forests provide turpentine oil, Sandal wood and its Oil, gum, Ephedra and Mazri. Ephedra is used incough. Mat and baskets are made from mazri. (vii) Forests help in causing rain, stopping floods and making atmosphere moderate. (viii) Forests provide a breeding place for difterent animals, and insects, which are useful for man, like honey bee. (ix) Forests stop, cold winds and regulate the flow of river and help in controlling floods. (X) Forests are the important source of government revenues and employment to the people. (xi) Cattle wealth is raised on forests because they become gazing field for them. (xii) Pharmaceutical industry depends on forests. (xiii) Forests, boosting the scenic beauty of the country, attract the tourists. The rights and duties of an individual and the welfare state run side by side. The welfare state fulfils the needs of its citizen and guarantees their welfare, where as the citizens are expected to perform their duties honesty and sincerely. (1) It is our duty to be loyal and faithful to our country and we should be prepared to offer any kind of sacrifice for the sake of our country and nation. (2) It is the duty of every citizen to respect the rights of his fellow countrymen. Good citizen is the one from whom the life, honour and property of the other citizen are safe. (31 It is the duty of public to make proper use of the public facilities provided by the government, without any wastage. (5) We must ensure that public property such as buses and railways are not damaged while traveling. So that public is not deprived of these facilities. We must purchase the ticket while traveling, because it is legal and moral responsibility. (6) It is our duty to pay the various taxes levied by the government payment of license fees for Radio, Television, Scoter, Car etc. should not be avoided. The income thus received is utilized in social welfare schemes in providing public facilities. The government alone should not be expected to provide all the welfare facilities, but the citizens should them selves make and run welfare plans on self help basis, to assist the government. At the time of partition, the Western part of the province of Punjab joined Pakistan due to its Muslim Majority while the Eastern part went to India. The Partition of the Punjab led to the partition of the canal system of the undivided Punjab. The head works of the Sutlej and the Ravi canal were in India, while some parts of Pakistan were irrigated by these canals. This created the canal dispute, which was later, resolved with the efforts of the Worlds Bank. A treaty between India and Pakistan was entered into in 1960 regarding the distribution of canal water. 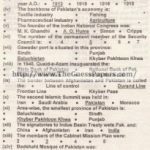 According to this treaty India was allowed total control over three eastern rivers (Sutluj, Beas and Ravi) while three western rivers (Chenab, Jhelum and Indus) came to Pakistan. As a result of this treaty and due to loss of three eastern rivers the shortage of water was made good through new dams, link canals and tube wells. Seven canals were also dug under the Indus Basin Treaty by means of which the water of the Western rivers is transmitted to the Eastern rivers so that the deficiency of water in the Eastern areas is made good.